We can convert or transfer Video Tapes to Digital Formats for storing on USB hdd, USB memory sticks, memory cars for easy playback and editing on computers or Apple Macs. MiniDV cassettes and VHS tapes can be saved for furture generations digitized to common formats such as MPEG2 avi mp4 mpg. 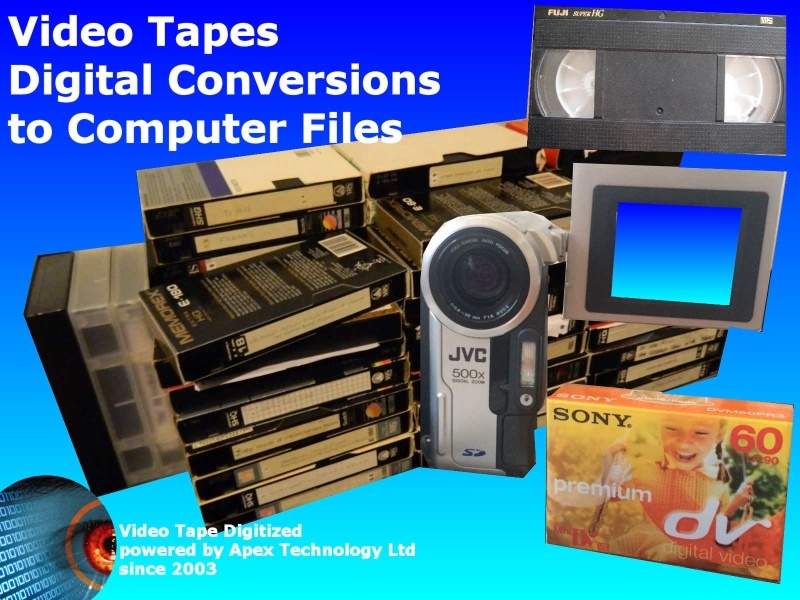 In the case of digital video tapes like MiniDV we can save the movie as the raw digital data direct from the tape so no quality is lost unlike some other conversion companies who digitise the analogue outputs, our transfer is digital to digital. If you need a Video Tape Transfer to Digital Formats service, then contact our friendly company. We can convert or transfer Video Tapes to Digital Formats for storing on USB hdd, USB memory sticks, memory cars for easy playback and editing on computers or Apple Macs. MiniDV cassettes and VHS tapes can be saved for furture generations digitized to common formats such as MPEG2 avi mp4 mpg. In the case of digital video tapes like MiniDV we can save the movie as the raw digital data direct from the tape so no quality is lost unlike some other conversion companies who digitise the analogue outputs, our transfer is digital to digital..